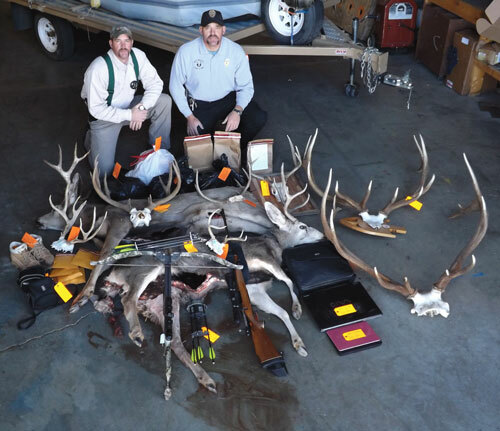 The photo tells a story: two conservation officers kneeling in front of two recently killed deer, a number of skull-capped antler mounts and the tools used for an illegal enterprise. 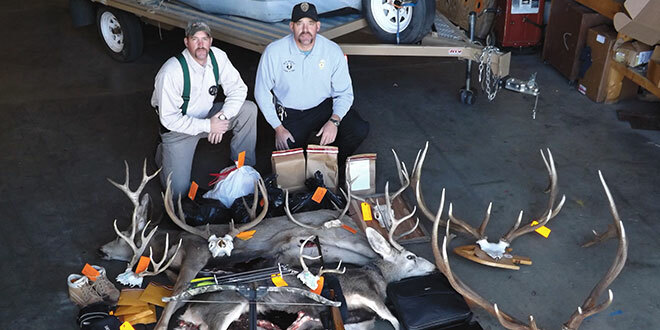 The case involved brazen acts of poaching by individuals who likely believed they wouldn’t get caught. They failed to consider the tenacity of New Mexico Department of Game and Fish conservation officers or how concerned members of the public embraced the ideals of modern wildlife management. It took nearly a year of investigative work and time in the court system, but an elaborate endeavor to steal from New Mexico residents was foiled in large part due to individuals who took a few minutes to pick up a phone. “All of it started with an anonymous tip through Operation Game Thief and some information from a confidential informant,” said Sgt. Kyle Jackson, one of the conservation officers who worked the case. In 2014, charges were filed against Esequiel Mascarenas, 36, of Las Vegas, N.M., in Colfax, Harding, San Miguel and Mora counties. He was found guilty of killing deer out of season, exceeding the bag limit, spotlighting while hunting and three counts of possession of deer out of season. He agreed to pay $4,500 in civil restitution and was fined another $2,000 by the courts. He also paid $600 in donations to Operation Game Thief and $305 in court costs. The State Game Commission then revoked Mascarenas’ hunting, fishing and trapping privileges for 10 years, matching the longest revocation in New Mexico’s history. Because New Mexico is a member of the Interstate Wildlife Compact, Mascarenas also has been revoked in all 45-member states, meaning he will be unable to purchase a hunting license nearly anywhere in the United States. “What we got him on was just the tip of the iceberg,” said Capt. Ty Jackson, who also worked the case. “This is an example of a true poacher. This was for the sole purpose of personal gratification and bragging rights. In January 2012, the Raton Game and Fish office received a call about an arrow protruding from a wounded deer in Cimarron. The deer was euthanized due to its wound and evidence was collected, including a crossbow bolt. There was no deer season in the area and hunting with a crossbow was not legal at the time. Capt. Jackson said a confidential informant hoping to reduce the amount of poaching near Las Vegas, and a separate anonymous call to Operation Game Thief pointed to the activities of Mascarenas and Nick Jaramillo, now deceased. Both callers supplied names and a description of the vehicle, a blue, four-door Buick car. The trunk of the car had been stripped and a drain plug installed to simplify cleaning up the blood. In October 2012 Capt. Jackson filed a request for a search warrant to allow officers to track the Buick in order to document the movements of Mascarenas and Jaramillo for the timely collection of evidence. The afternoon before Thanksgiving, conservation officers followed Mascarenas and Benjamin Arguello, 38, of Las Vegas, as they drove to Cimarron. Under cover of darkness, they shot a mule deer buck with a crossbow behind the historic St. James Hotel. Unable to find the deer, they drove to Roy, shooting two bucks with a rifle west of the town. To avoid detection, they called Kevin Archuleta, 26, of Las Vegas, to pick up the deer in his car. The three arrived at Mascarenas’ home after midnight. Officers watched as they unloaded the deer from a small red car. A search warrant was executed to examine Mascarenas’ home and car on Thanksgiving Day. Conservation officers found a 7mm magnum rifle and Excalibur crossbow, both with scopes, in the trunk of the Buick. A search of the house turned up five buck deer skull caps, two elk skull caps, deer and antelope capes and two deer killed the night before along with three packages of hunting photos. “From the photos and other evidence found, we were able to determine the poaching activity had been going on for years, but the total number of deer illegally killed may never be known,” Capt. Jackson said. “There were a lot of officers involved who did outstanding work finding the kill sites so DNA could be collected that tied him to the animal. Archuleta and Arguello also were convicted for their roles in the case. Sgt. Kyle Jackson and Capt. Ty Jackson, conservation officers for NMDGF, kneel behind evidence collected at the home of convicted poacher Esequiel Mascarenas. NMDGF photo. “It was satisfying to catch them,” Jackson said. “The night we caught them, they drove about 300 miles to shoot three deer. Poaching is the illegal taking of game or fish and can negatively impact wildlife populations across the nation. 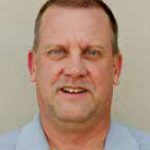 When Game and Fish personnel survey wildlife and establish the number of available licenses, it is done so with the thought process of legal take. Poaching is difficult, if not impossible, to factor into the equation and can be particularly damaging to smaller wildlife populations. True conservationists understand hunting and angling license dollars are the primary funding mechanism for wildlife conservation efforts. In contrast, poaching dates back to a time prior to modern practices when unregulated and market hunting decimated wildlife populations. Anyone with information about any wildlife crime should contact the department’s 24-hour, toll-free Operation Game Thief hotline, (800) 432-GAME (4263). Callers can remain anonymous and may be eligible for rewards if charges are filed. Reports also can be submitted anonymously online at wildlife.state.nm.us/ogt. Game and Fish personnel often receive questions about the leniency of fines and lack of jail time in cases involving heinous poaching cases, such as an animal’s head being removed and the meat left to waste. Some cases involving endangered species and wildlife trafficking are federal offenses that can carry stiff fines and jail time. 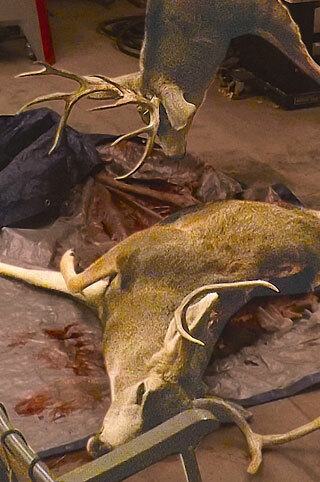 Officers found two freshly killed deer at a convicted poacher’s residence. NMDGF photo. To promote modern wildlife management practices and discourage poaching, civil assessments for the loss of the state’s wildlife have existed in New Mexico for over a century. Civil assessments are separate from the criminal case and often require a separate civil trial. If the animal happens to be especially large, the civil assessment can exceed $10,000. The State Game Commission adopted the current assessments in 2006, covering elk and ibex to beavers and birds. “But assessing an individual for the loss of an animal begins with conservation officers presenting a strong case that leads to a guilty plea or verdict,” Capt. Jackson said. “If an individual is found not guilty, there is no restitution. “People who are not satisfied with fines assessed in poaching cases should consider addressing this with their local magistrates,” Capt. Jackson said.